If that isn’t enough to make your jaw drop, there’s more: A portion of sales from each tasting menu is donated to local charities. 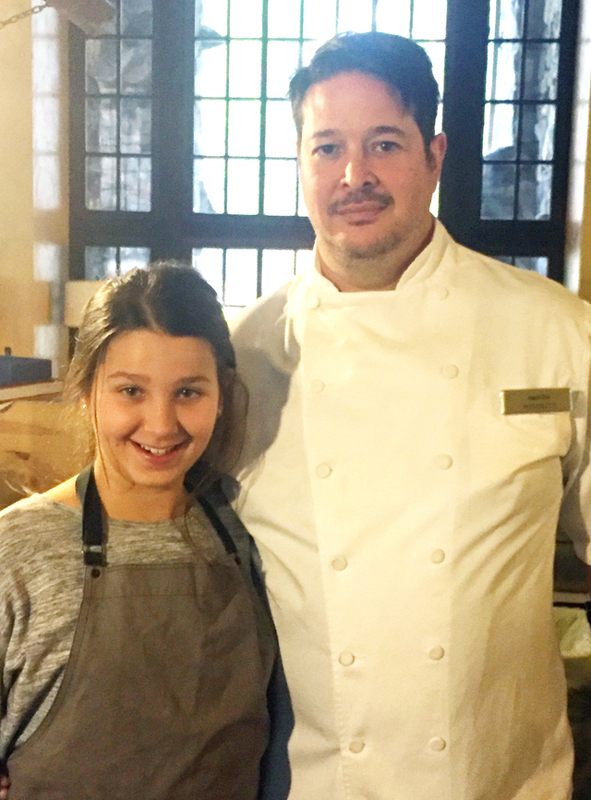 After adopting this practice when it opened, the restaurant has now raised more than $350,000 for worthy community organizations. 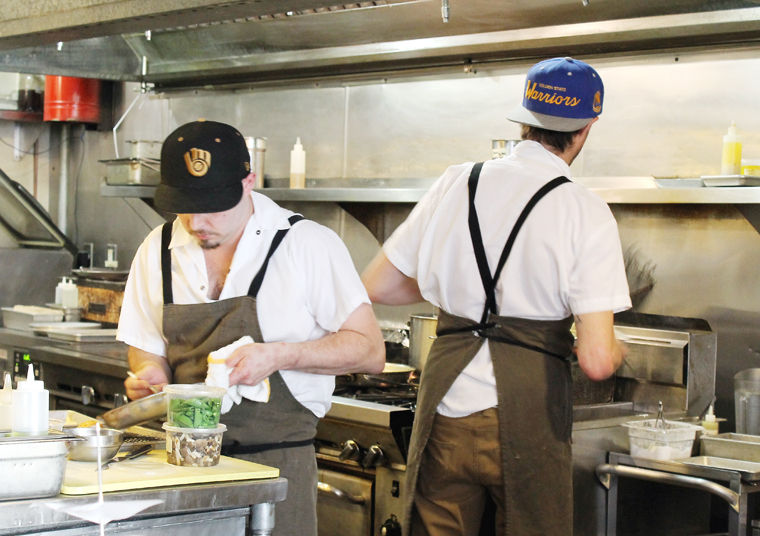 When it comes to the food, Commonwealth a restaurant that somehow does high-concept in a very relaxed way. 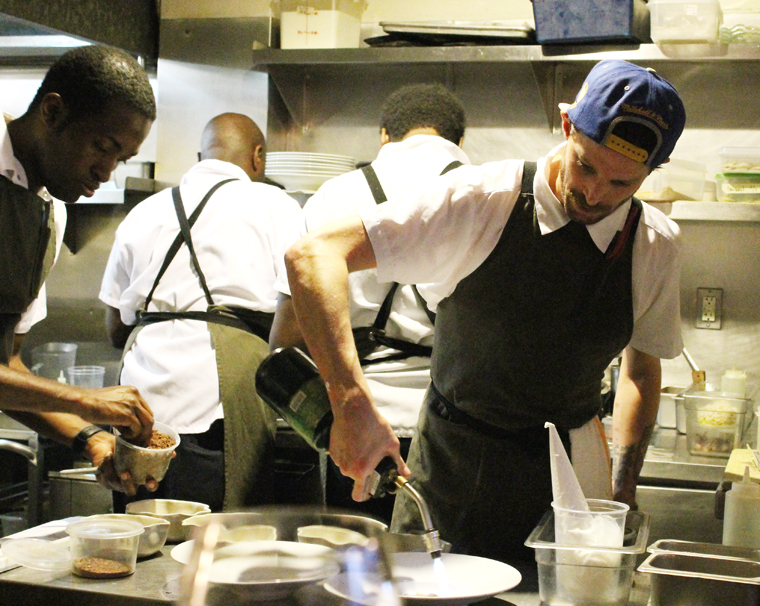 What’s on your plate may have required multiple chefs to put together with modernist techniques yet it always feels accessible in a way that it doesn’t necessarily at other upscale restaurants. Adding to the comfort level, this is a place you can come in jeans without feeling out of place. 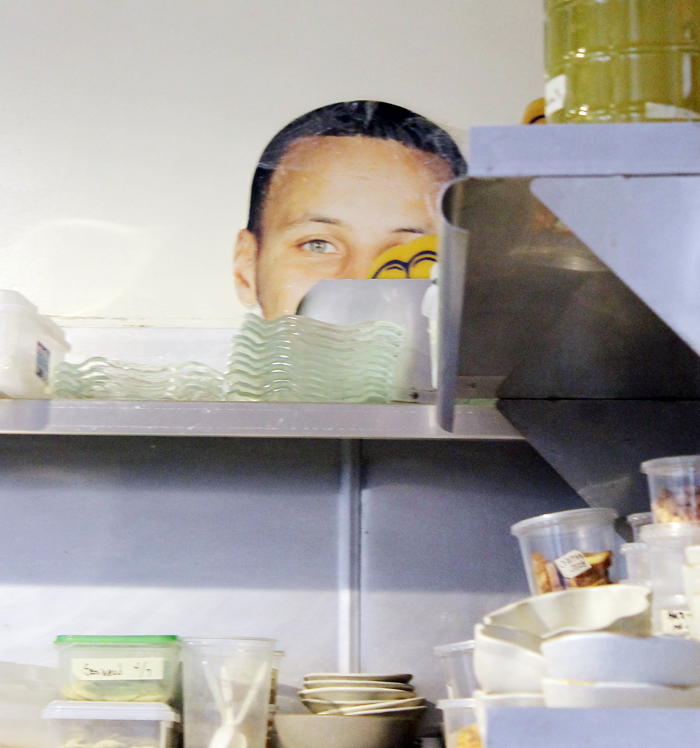 Do you think these kitchen members are Warriors fans? Uh, I would say affirmative! Fox sources some of his ingredients right from the roof — where there is a greenhouse, bee hives and beds to grow herbs and hard-to-find greens. The counter seats right by the kitchen afford a view of all the action, which is where we sat. Not your ordinary chips and dip. 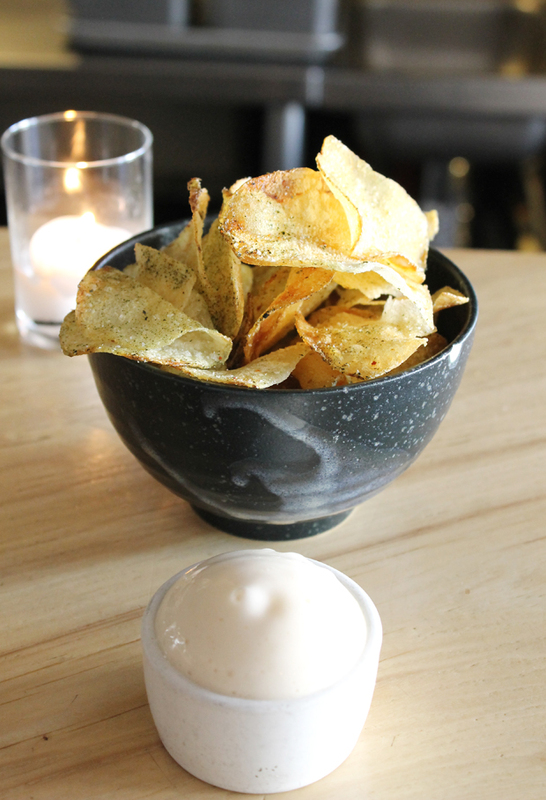 A bowl of house-made seaweed potato chips is brought to every party, along with malt vinegar mousse. Yes, it’s a play on British fish and chips, and you will find it very hard not to eat the entire contents as the night proceeds. The crisp, slightly briny chips are the perfect scoop for the airy white foam that explodes with maltiness and tang, then dissipates in a flash. 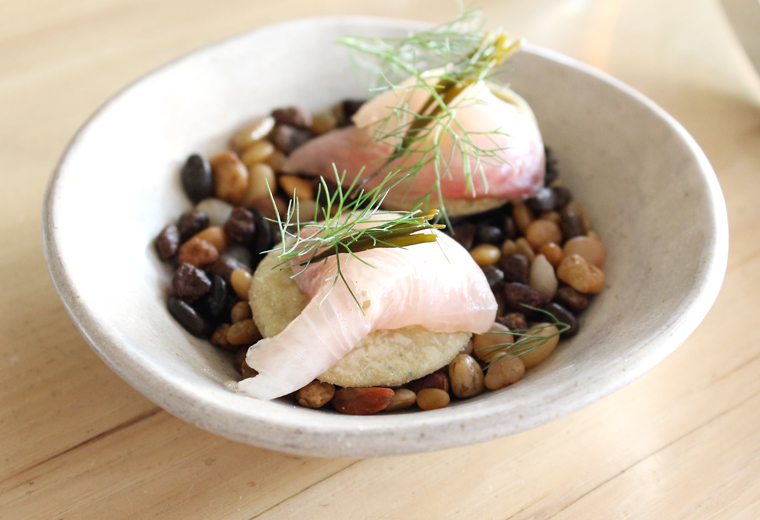 A pale pink sliver of cured amberjack arrived as an amuse, propped on a delicate, shortbread-like seaweed cookie, dabbed with cured egg yolk and lemon aioli. 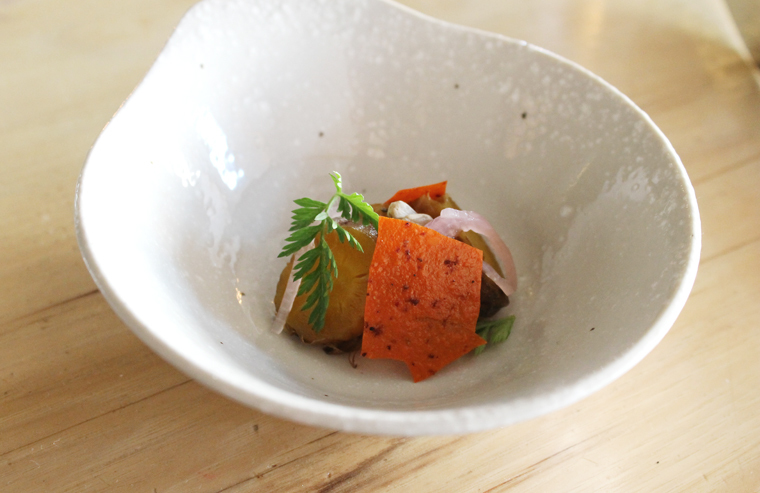 Roasted carrots and dehydrated carrot chips. Roasted carrots tasted as sweet as candy, and got a hit of nuttiness from sunflower seed butter. Have you ever had noodles formed out of squid? You will here. The tightly curled noodles were both chewy and crunchy, accented by spiralized daikon that mimicked them in appearance. Spring peas added color and sweetness, while crispy bits of chicken skin added a playful element of crunch. 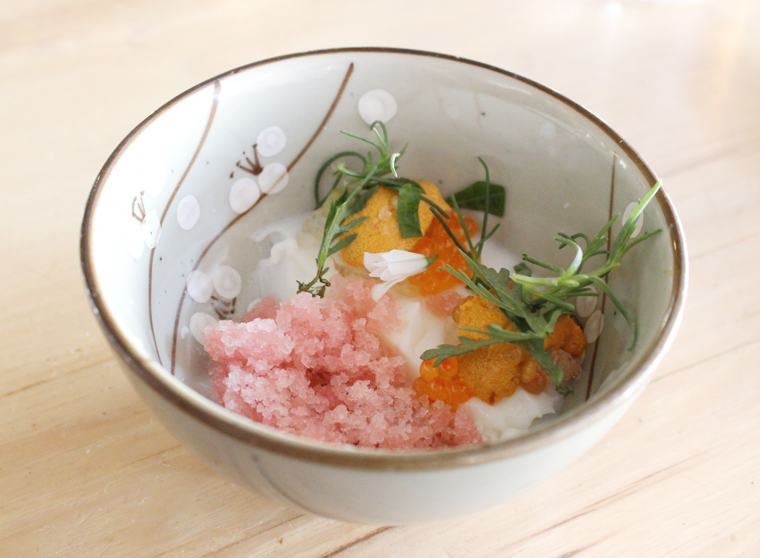 A dish that reminded me of spring cherry blossoms — with uni and rhubarb granita. Buttermilk panna cotta made an appearance next with rhurbarb granita. But this was no dessert. Not with uni and trout roe on it. The panna cotta was cool, creamy, tangy and not at all sweet; the granita was acidic, bracing and fruity, and the uni was sweet and briny. I don’t know how they ever thought to put all these elements together, but they definitely melded in harmony. Can you spot the scallops? It’s right in front of your eyes. 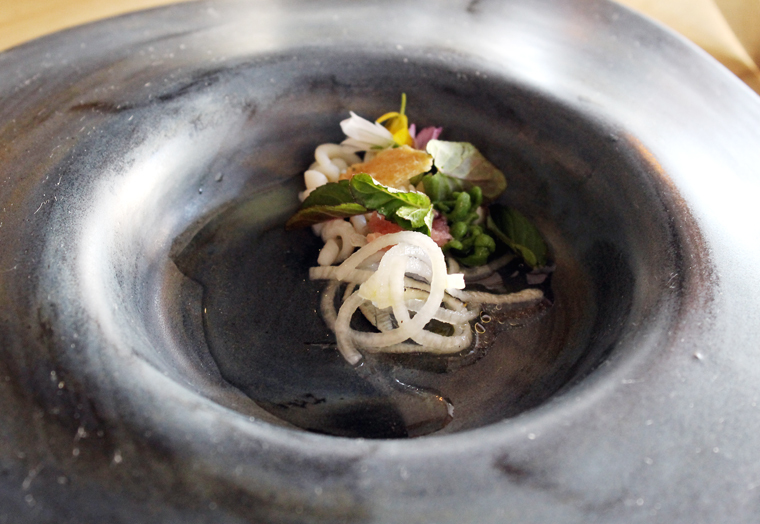 Take a look at this next dish. It’s scallops. No, they aren’t hidden underneath what look almost like Chinese chow fun noodles. They are those noodles. 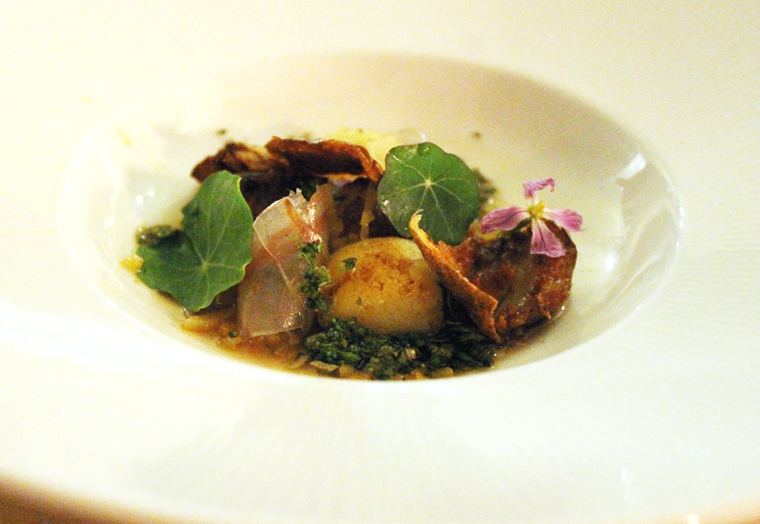 As the sommelier explained, the scallops are pureed, then cooked sous vide, before being cut into wide ribbon noodles. How incredible is that? 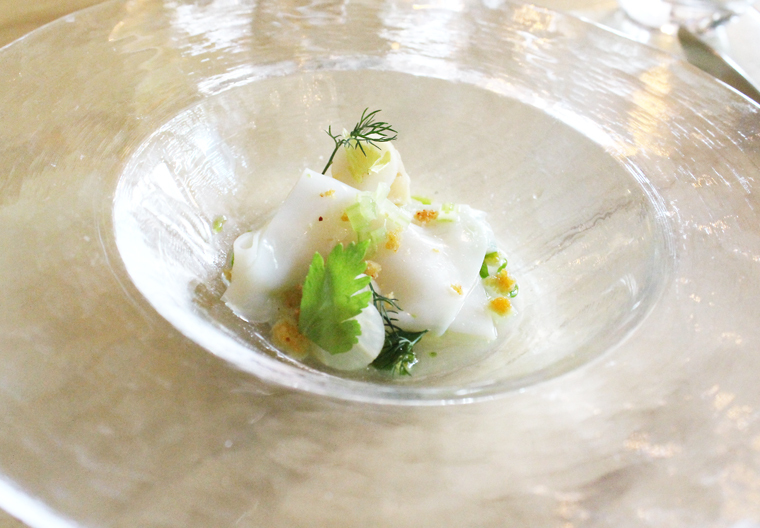 You put it in your mouth expecting the starchy taste of noodles, but what you get is the sweetness of scallops front and center combined with baked celery root, fresh dill, and spiced breadcrumbs — all in a chilled celery broth. Totally mind-blowing. 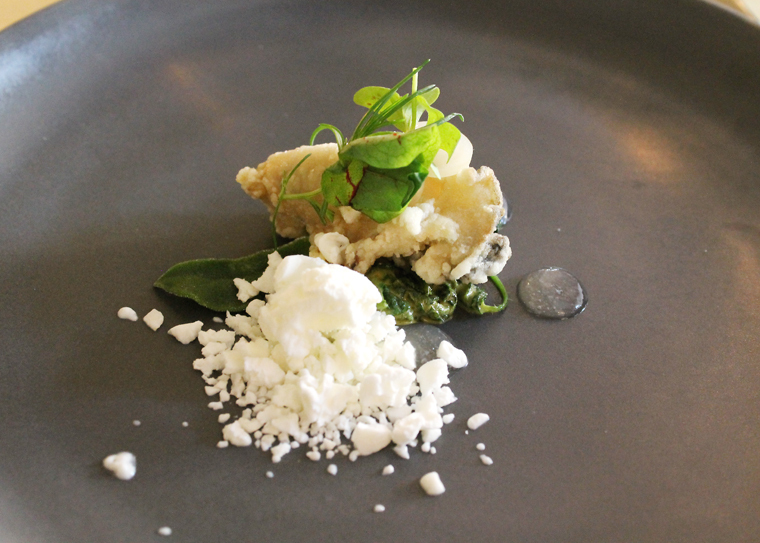 A Kusshi oyster was fried tempura-style and served with creamed nettles, lemony sorrel and horseradish mousse that had been frozen with liquid nitrogen to create the texture of icy snow. I could easily eaten a half dozen of these. Fried oyster with frozen horseradish mousse. 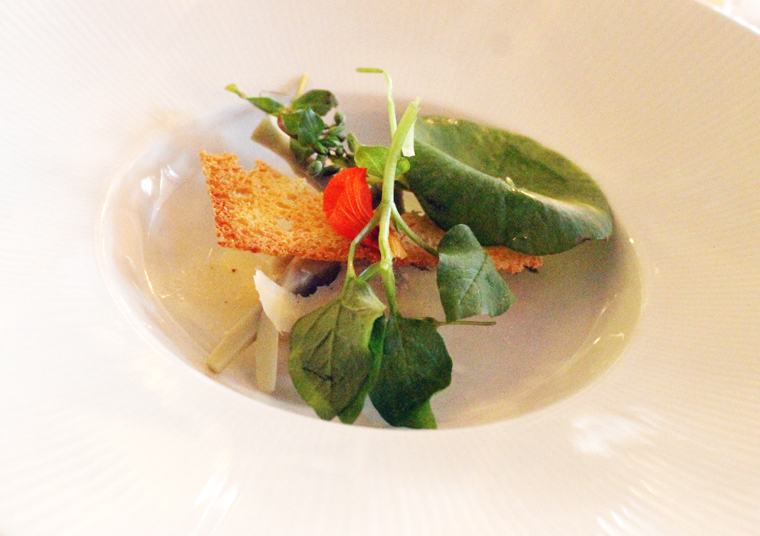 Sweatbreads and shrimp mousse in Little Gem leaves. 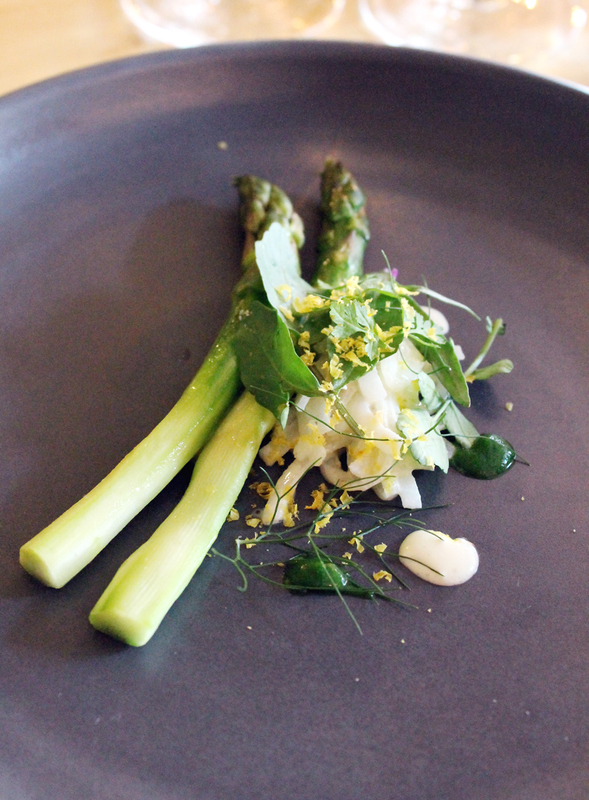 Thick spears of asparagus, with ends shaved, arrived next with a potato salad of a different sort. The potatoes had been shaved into ribbons that were cooked just a little softer than al dente. Smoked egg yolk added creaminess, along with pil pil sauce, a classic Spanish preparation in which a creamy, velvety thick sauce is created just by cooking salt cod and olive oil together. More spring veggies arrived with artichoke hearts dressed with burnt lemon vinaigrette, and a lacy parmesan frico. Then it was on to a tiny roulade of shrimp mousse wrapped in Gem lettuce with sweetbreads cooked in beeswax, rendering them so unctuous. 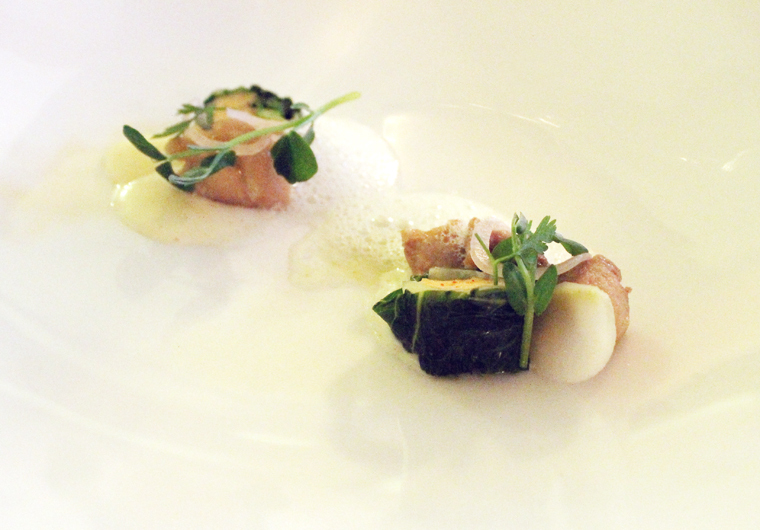 The dish was finished with a sweet milky froth of yuzu koshu and a popcorn puree. 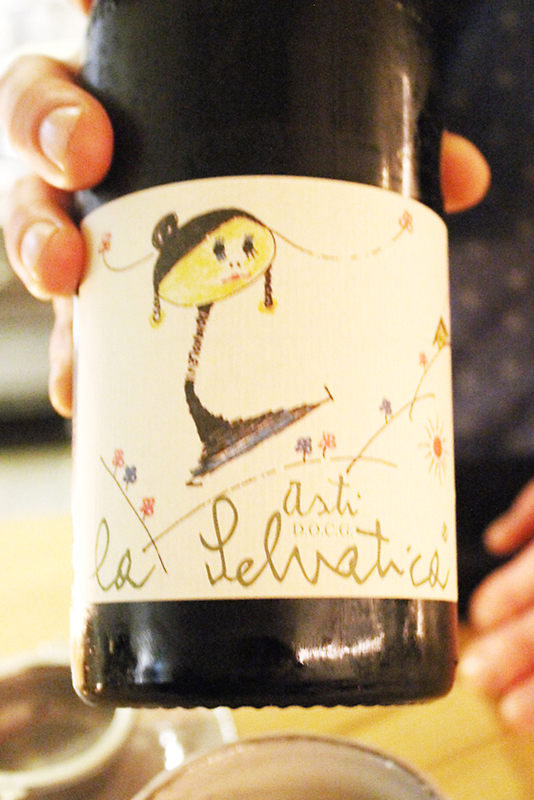 There was a note of grassiness, as well as a smoky spiciness that sneaks up on the finish. Pork jowl with granola? You bet. 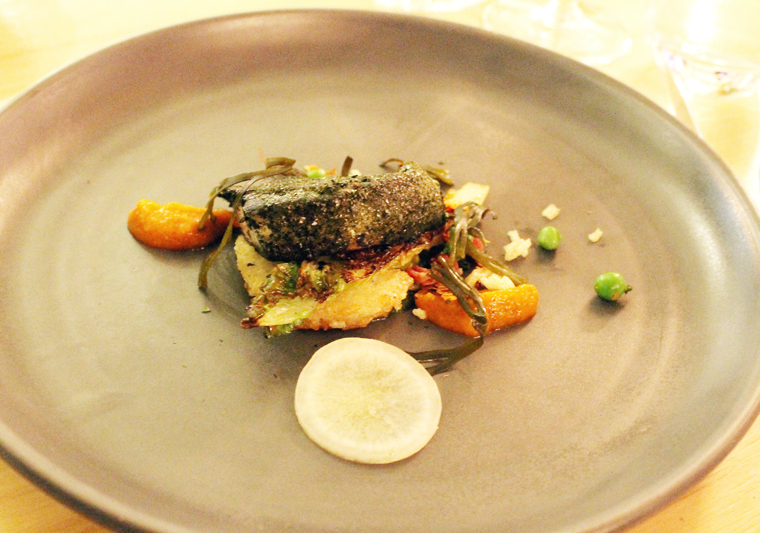 Again, seemingly incongruous elements came together in harmony in the next dish of pork jowl on a crisp rice cake garnished with not only crunchy strawberry and pea granola, but kimchi and seaweed. The pork was wonderfully fatty and rich yet somehow rendered not heavy tasting because of the spicy kimchi and the sweet-savory granola. 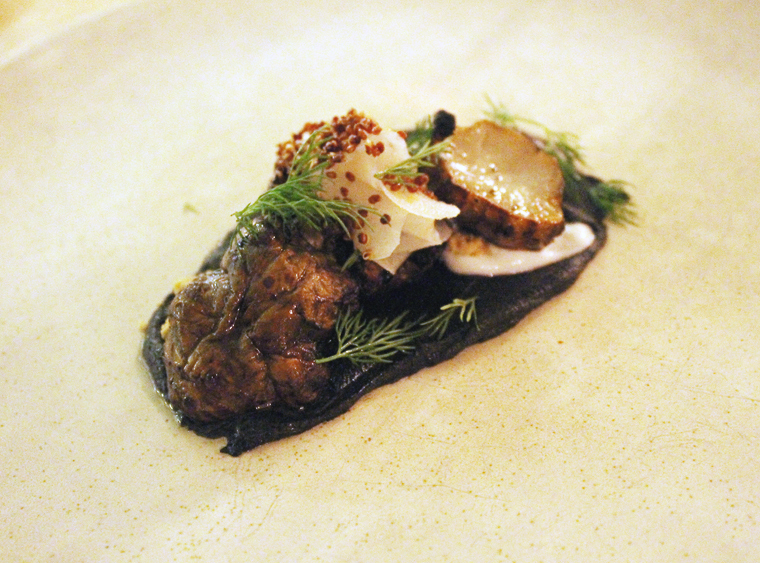 While I enjoyed a dish of barbecued sunchokes with caramelized, savory yogurt, my husband, who is not a big fan of sunchokes, got instead a tender potato dumpling with lardo and charred broccoli. Both were delicious, but I would give the edge to his dish. The final savory course was lamb cheek with chewy purple barley and barbecued date butter. The meat was mildly gamey and oh-so succulent. 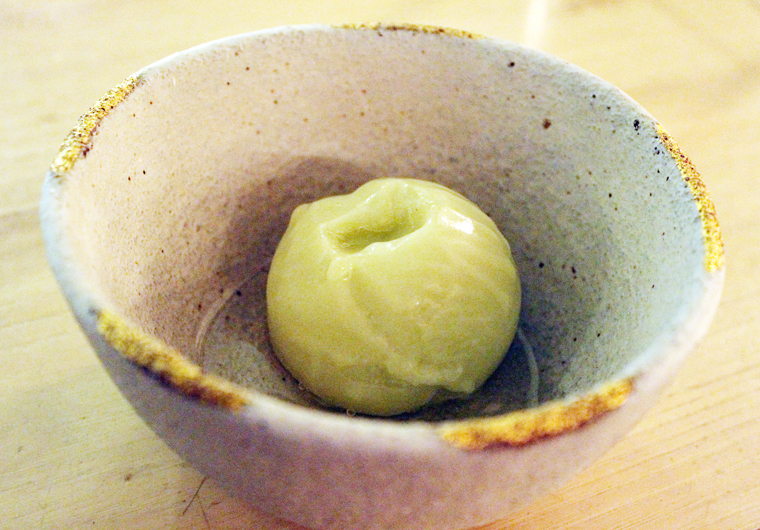 A sphere of green celery sorbet is delivered as a palate cleanser, complete with a dimple at the top in which puckery-winery verjus is poured in. Grassy, savory, a little sour, and with a little hit of salt, it definitely revives the taste buds. Desserts are all of the creamy, spoonable type, which might make some long for a little more variety. 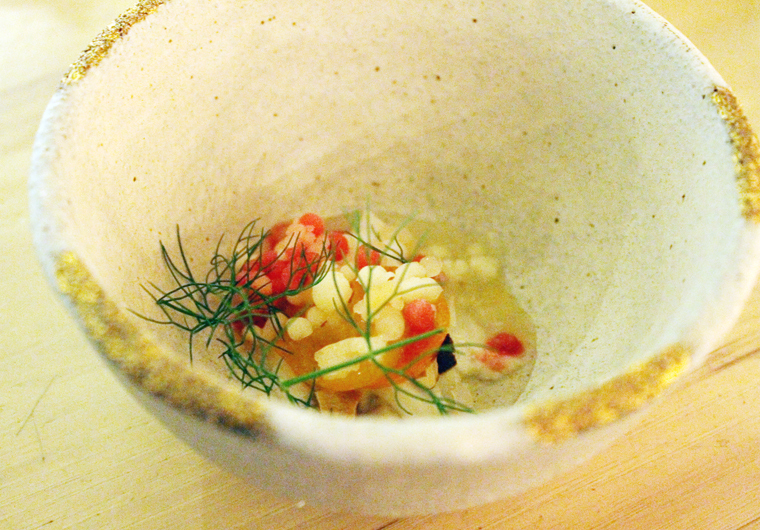 First, almond milk pudding prettily decorated with candied kumquats, citrus and wild fennel. 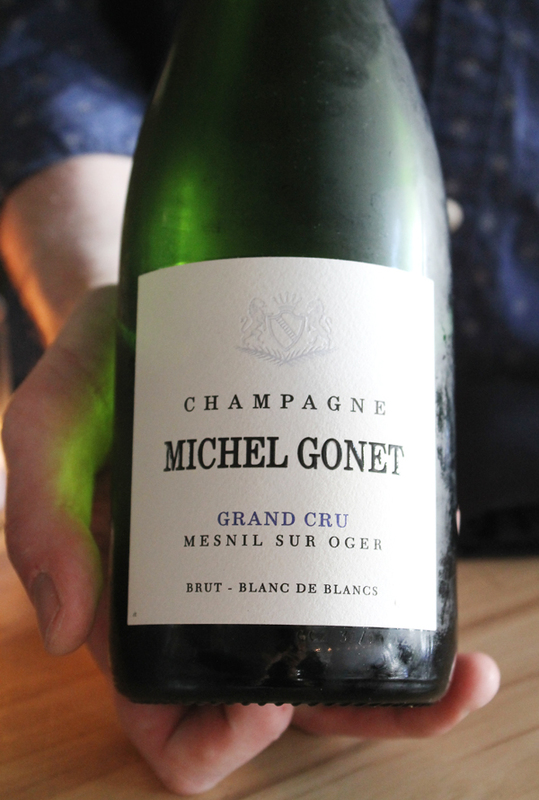 The fruit’s acidity is tamed by the cool, creamy pudding, as given depth by armagnac. 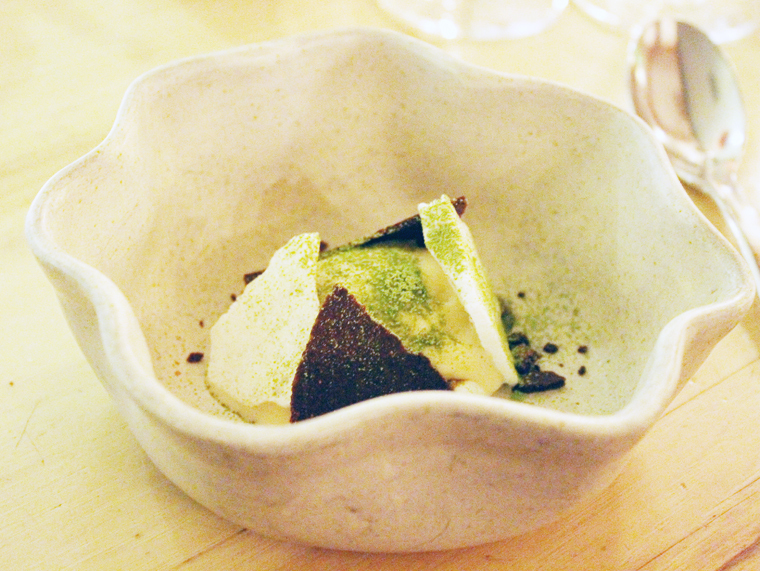 Next is burnt honey ice cream with thin matcha meringue shards and chocolate tuilles leaning up against it. It satisfies the desire for something sweet and for something chocolate without being overwhelming. 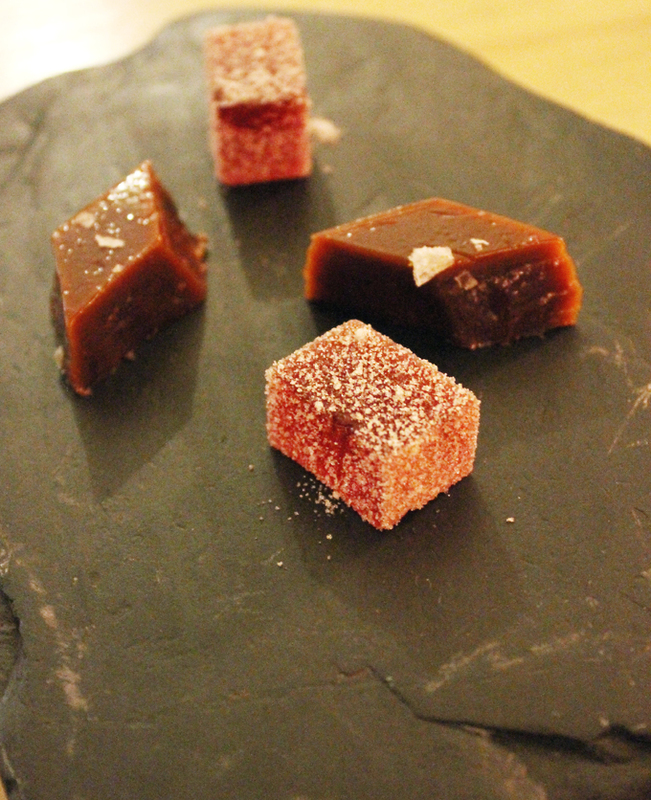 The meal ends with sea salt caramels, with a nice buttery, slightly bitter edge, and pomegranate pate de fruits. 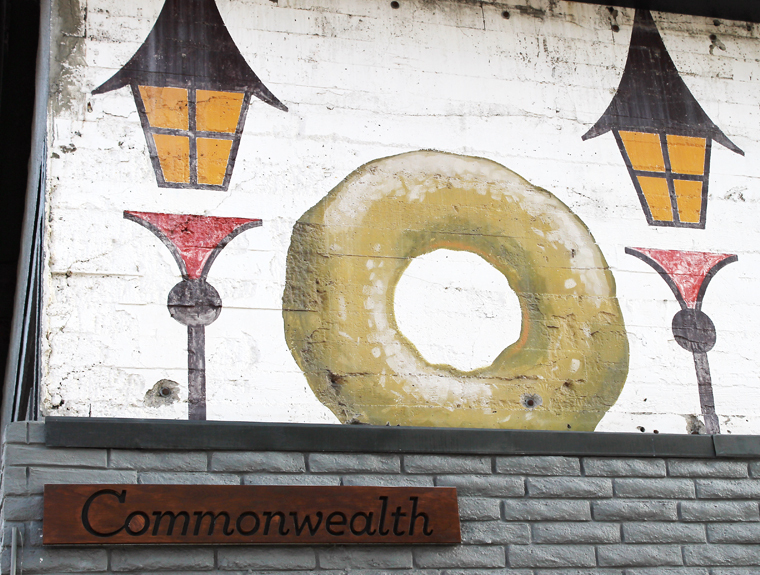 This was my first time dining at Commonwealth in a few years. It’s not only maintained its edge, but gotten even better. No wonder it’s long been such a favorite by those in the know.